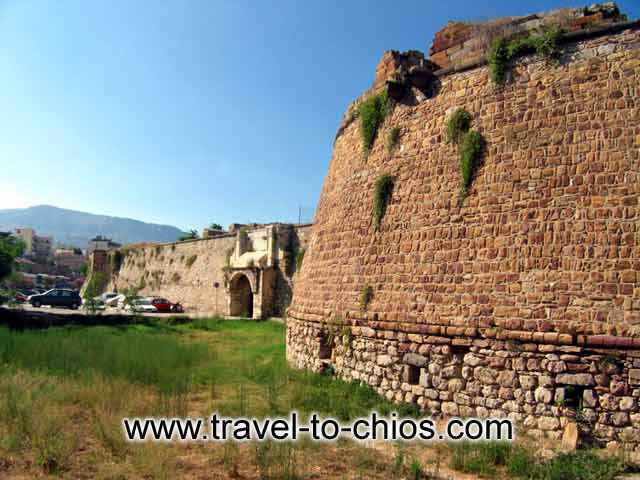 The Castle or Fortress of Chios lies north of the center of town. 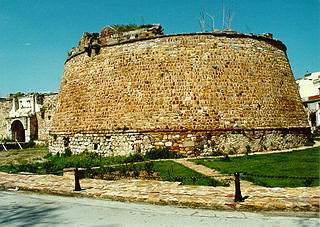 When it was built, it enclosed the entire town of Chios, soon thereafter, however, the town expanded beyond the Castle walls. The first architectural phase of the monument dates back to the Byzantine period (the end of the 10th century), however, almost nothing has survived of the original fortification. Its entrance is through the Central Gate (Porta Maggiore) located at the south end, which was reconstructed by the Venetians in 1694. In the enclosed area, near the gate, stands the two-story building known as the Ioustiniani Palace. Two of the most important structures inside the Castle are the Kria Vrisi (Cold Fountain), a semi sub-terranean water cistern built under the Genoese and the massive tower known as “Kulas.” The Castle was surrounded by a wide moat that has now been filled. The present form of the Castle is a result of a series of additions, reinforcements and repairs that were made by the Genoese, Venetians and Turks beginning in the early 14th century and onward until the Greek War of Independence. The Castle suffered severe disasters in the bombardment of 1828 and the earthquake of 1881 and was seriously damaged at the beginning of the 20th century. The entire southern portion of the Castle was demolished in order to construct the port. In recent years, excavation research was carried out over the course of house construction within the area. This research brought to light important evidence regarding the morphology and history of the fortress. Over the course of the recent restorations work, the main entrance of the Castle has been consolidated, the façade of the building called “Dark Dungeon” has been cleared, its masonry has been repaired and its roof reinforced. The vault of the entrance of the Castle has also been consolidated, recent plastering has been removed and the wall masonry has been repaired. The joints of the stones of the SE bastion were also repaired and the passageway on the walls was cleared over the main gate, revealing the pavement. Nowadays, residents inhabit the Castle.